To conclude this series of posts on root position voicings of the major ii-V-I progression, here’s a tune I composed called ‘Elijah’s Bounce‘. 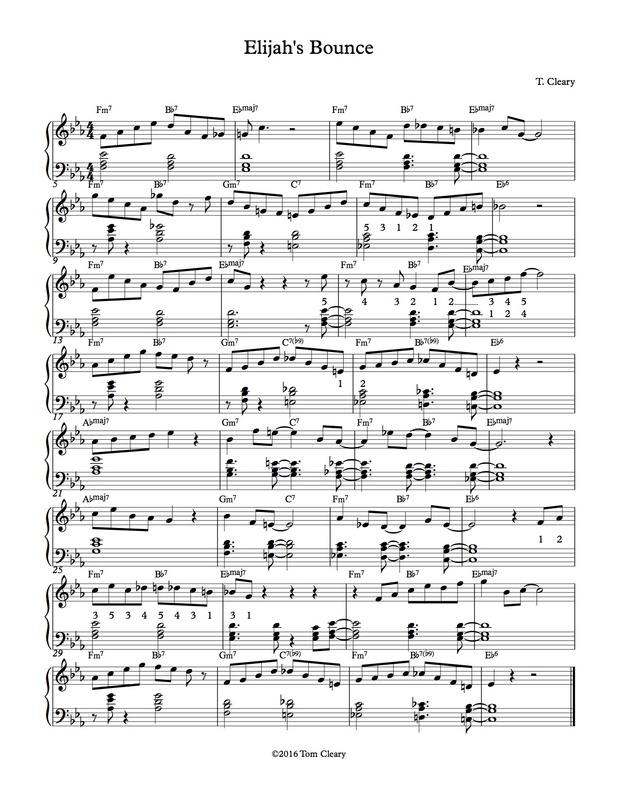 I borrowed the chord progression from the Charlie Parker tune ‘My Little Suede Shoes.’ To outline the ‘short’ ii-V and ii-V-I progressions in this tune, I’ve used patterns based on root position voicings, including those discussed in Part 3 of this series. As a introduction to the concept of rootless voicings, I’ve also included patterns based on rootless voicings built ‘off the 3rd’ and ‘off the 7th’ , including some of those shown in the ‘Midnight Donna and Reets In Paris’ exercise that appears in an earlier post. I will be discussing the comping and melodic uses of rootless voicings in upcoming posts. In the written left hand comping, each ii-V or ii-V-I lick in the right hand line is accompanied by a voicing that matches its shape. My point here is not to imply that all right-hand melodic shapes should be based on left-hand voicings; this tune is just an example of how voicings can be one of many sources for melodic ideas. ‘Melody outline voicings’ such as these can also horizontally condense a melodic line in a way that makes it easier to memorize. (Disclaimer: any resemblance to the following tunes in the measures listed is purely accidental: Round Midnight (m. 1); Moody’s Mood for Love (m. 3); Boplicity (m. 5); Four Brothers (m. 6-7); Dancers in Love (m. 9); Peri’s Scope (m. 11); Donna Lee (m. 15); Afternoon in Paris (m. 21); Radioactivity (m. 25); 26-2 (m. 27).) The left hand part of this tune also is an example of using upbeats in comping to accent upbeats in a melodic line, which helps maintain a sense of forward motion. I have added suggested fingerings in some places. I hope you enjoy playing this tune, which is named after a student of mine who shows up for his lessons with a wonderfully bouyant energy. A recording of the tune can be heard here. This entry was posted in Root Systems (root position voicings), Uncategorized. Bookmark the permalink.